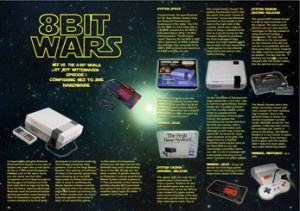 Fans of the humble Nintendo Entertainment System can learn more about their favourite machine with a new issue of NES-Bit, a fan magazine devoted to all things 8-bit. The second issue features a look back at the NES vs. Master System war, a guide to importing Famicom titles, a Castlevania series retrospective and much more. It's twice the size of the previous issue, too. The best part of all is that a download of the magazine costs just 99p, or $1.59 USD. You can download NES-Bit Magazine volume 2 now for a trip back in time. Thats cheap, and very valuable. In North America, NES Vs. Master System was less of a console war and more of a full-on console massacre. I still think we need Nintendolife Magazine. Hmm... An interesting piece of reading to be sure. I may take a look at this at some point.